Playing a gig at the Limelight. An experience money can’t buy for a local band. Carrying the same weight amongst Belfastians as The Roxy or The 100 Club does to a Londoner, Limelight has a comparable history to any venue in Northern Ireland with all the accessibility that the Ulster Hall lacks. This isn’t just any venue, this is OUR venue, the venue of the people. It’s only suitable that our bands should be the ones putting on a show. The doors open a little after 7 PM and the stench of sticky floors and Morgan and Fanta fills the nostrils just before the unmistakable rumble of sound checking reaches the ears (“testing, testing… I’ve got absolutely nothing from the bass amp…” etc etc). A sizeable enough gathering of close friends is inside already, and as I sip my Becks they grow into a crowd. The intimacy of Limelight 2 flourishes into a delicious claustrophobia, as those lucky enough to grab a seat (such as myself), watch the mob by the stage fester, soaking in the tangible energy and history banging off the walls of this storied venue. Mob Wife are the first to take the stage. They announce themselves to the crowd with a power chord and inform us that this is their first gig (not a bad venue to start). They don’t sound like it. Thick bass lines dominate a set that is dripping in malice while the lead guitar slides seamlessly in, injecting the crowd with its energy. Closing song ‘Warm Water’ is a winner tonight, a riff-heavy moshfest with RATM vibes. Chunky and exhilarating, the saved their best for last. The second act to brave the breach is Wynona Bleach. If one thing stands out in particular from their set is that they know how to make an entrance. UV light bathed the band, accentuating the florescent green decals of the band… and hair of the frontwoman (it’s hard to do justice in text, but it looked fantastic). Combining alternative riffs with dreamy indie vocals, the five-piece sounded something akin to Wolf Alice, emotional and slow one moment and a headbanger’s paradise the next. Crowd pleaser ‘Sugar’, for example, saw Wynona at their best, with punchy twin vocals punctuated by erratic licks and plenty of crowd cooperation. Immediately following came dreamy indie rockers Beauty Sleep. Arguably the most interesting band to take the stage, their variety of vocalist and non-conventional instruments gave them an added dimension (I also have a lazy stereotype that bands with bassist singers are trustworthy performers. I’ve no idea where this came from, but Thin Lizzy are good and so are Beauty Sleep, so the data backs it up). A set with a dreamlike swing and an indie kick ensured that there was many a bopping punter, as Beauty Sleep entertained us with their own brand of heavy. Their use of a synthesiser gave a grander, more spacious feeling, elevating some of the cabin fever while infusing some body sway into the assembly at the stage, which now stretched as far back as the bar. Just in time for the next act. Hand Models and Hot Cops are the next two acts to take to the stage. The venue is packed by this stage, so much so that I steal a glance away from the stage, mostly to see if the line at the bar has quietened or not, and notice that even the walls are sweating. Models take to the stage and play a lively but shortened (out of their control) set. As they take the stage, cheers go up from the bands and fans in the crowd; after all, this is their party. Seemingly unaffected by the delay, they launch into the distortion-heavy, guitar-driven show. The first colossal feeling band of the evening, the play the crowd like a conductor plays an orchestra, their licks dictating the sway and speed of the crowd. The punk-inspired riffs and sharp lyrics of ‘T.V. Kids’ have Limelight 2 in bits, while ‘Sunrooms’ takes a grungier turn, sounding like a mix between Heart-shaped Box and a swift blow to the temple. They end their slot with their newest single ‘Banana’. And yes. They wore the banana suits. Hot Cops are on quickly after, playing a set that fuses all the darkness of a western with the twang of a sci-fi. The sneering, suede-esque vocals of ‘Negative One’ meld with the piercing guitar, bestowing a punk pedigree and indie vibe, while the subtle vulnerability of the lyrics gives the impression that we’re all party to some dirty secret. A breakneck set, but I found it hard to fully appreciate because I could not tear my eyes from guitarist Carl Eccles. Every song seemed to deliver a higher quality solo or lick, each one more impressive than the last. Finally, came the main event. The Wood Burning Savages took to the stage amidst a recorded political speech being played over the speakers. I had a feeling that the show might have had some political undertones and/or overtones: how very unlike them. Frontman Paul Connolly takes up his microphone, brandishes his guitar, sporting an “Ulster Says Know” t-shirt and fires into opening track ‘Stability’, a fiercely aggressive tone-setter. The Savages prove to be as fearless as they are relentless, with ripping guitars and carnivorous drums. Connolly displayed his impressive vocal range, as he belted out the lyrics of ‘I Don’t Know Why I Do It To Myself’ with the same gravitas as a young Paul Weller. The Derry quartet are ferocious live, attacking their instruments with a vigour usually saved for blood feuds, but the gig was more than just music. The short explanations in-between songs, such as the link between ‘Sisters of Mercy’ and abortions in Ireland, the jagged movements on stage, the political catcalling, it all cumulates into something more akin to theatre. The Wood Burning Savages, in a cramped venue in South Belfast, gave a crowd of locals something Stormont hadn’t given them in over 580 days: their moneys’ worth. 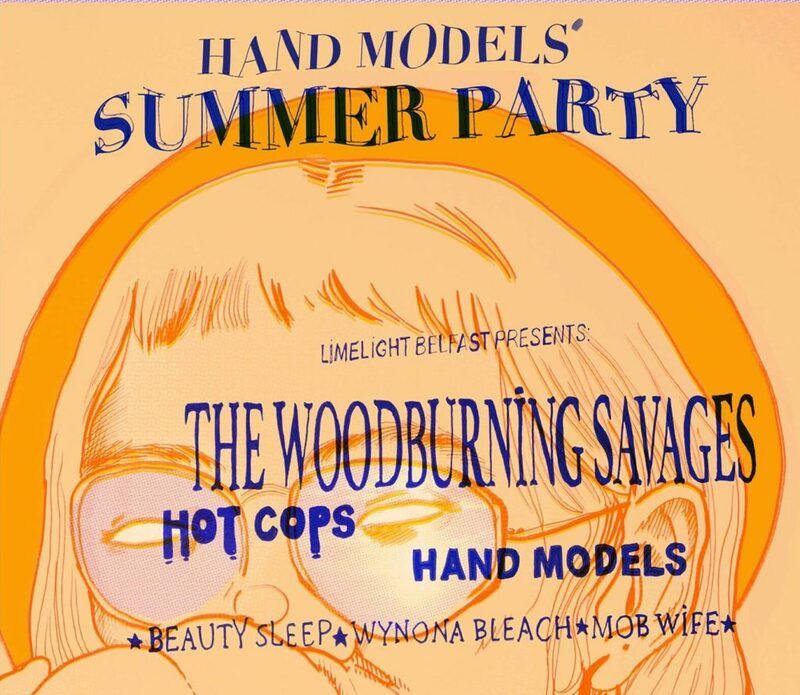 More than a success, the Hand Models Summer Party was a triumph for local music. While fully demonstrating the breadth and diversity of some of the best the local scene has to offer, in a venue that only locals could truly appreciate, the Summer Party also housed what has arguably been the best Belfast gig of 2018. Here’s to next year. Drone Mansions were selling 5 track compilation cassettes on the night featuring the show’s line-up. All profits were donated to Mindwise, a leading Northern Irish mental health charity. These are still available in digital and cassette formats from the bandcamp link below.